Ohio State’s Urban Meyer will retire after the team plays Washington in the Rose Bowl on January 1st. 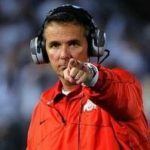 At 54 years old, Meyer has spent the last seven seasons with Ohio State (bringing them a national championship in 2014) and six years before that with Florida where he won two national titles. Meyer’s year in Ohio was bumpy, as he was suspended for a few games for not properly reporting a domestic abuse allegation against one of his assistant coaches. With a cyst on his brain leading to constant headaches, Meyer has also had to deal with some significant health issues. Offensive Coordinator Ryan Day will take over on January 2nd. On Monday Night Football, the Philadelphia Eagles got the win over the Washington Redskins. The Redskins have had bad luck at quarterback this year with their starter Alex Smith out for the year with a broken leg and then backup Colt McCoy suffering a fractured fibula in the second quarter. Signed by the team just two weeks ago, Mark Sanchez took over. Unfortunately for the Redskins, though, they’ve had too many injuries and too little time left in the season. Eagles 28, Redskins 13.